During this week of Martin Luther King Day, I’ve found myself reflecting on both the state of equity in America and my personal journey toward the greater understanding of such. While serving, I felt the Air Force believed this ideal even if it wasn’t always successful at achieving it. It wasn’t until I retired from the Air Force and managed a nonprofit with social justice as one of its core tenets, that I gained deeper insight into the meaning of equity. In fact, I was some 50 years old before I can remember hearing the term “white privilege”, especially used in reference to me. The job was an ill fit for a hard-charging retired Colonel who wasn’t really prepared for the vastly different culture I would encounter. One example was my effort to learn more about each staff member by taking them to lunch. One of my goals was to learn what was important to them and how I could support them. One, an African-American transgender male, seemed very distrustful of me and was not interested in opening up to me or helping me navigate the new environment. He indicated early on that I didn’t understand and when I asked him to help me understand, he said that wasn’t his job. I was incredibly put off by his response and did not try again to reach out to him. A decade later I understand more about what he meant when he said it was not his job to make me understand. When I think back on it now, I’m mortified at how ignorant I was about the real state of equity (or rather inequity) in America. I credit the Arizona School Boards Association for much of my increased awareness and understanding. I’ve gained great insights via attendance at conferences, tuning in to webinars, being a part of the Black and Hispanic and Native American Indian caucuses, or just talking to the very diverse membership. I’ve also enhanced my understanding of equity challenges by reading a variety of books and articles on the subject. One such book is “A People’s History of the United States” by Howard Zinn. According to the publisher’s summary, it “is the first scholarly work to tell America’s story from the bottom up – from the point of view of, and in the words of, America’s women, factory workers, African-Americans, Native Americans, the working poor and immigrant laborers.” My perspective is that it lays bare, the truth about American exceptionalism. Yes, our founding fathers set out to create a “more perfect union”, but they did not do it on their own. They did it through a combination of grit and ruthlessness and on the backs of those who largely, were not white. White settlers n America and the soldiers that paved their way, were for all practical purposes, a conquering force. And let’s face it, those being conquered always get the raw end of the deal. As we know though, America’s indiginous people were not the only ones used, abused and slaughtered. There has always been some group of people who paid the price for the rest of us to succeed and prosper. Another book I recently listened to, poignantly drove that message home. It is a novel called “Washington Black” by Esi Edugyan and tells the story of the fear and brutality of slavery in the 1800s. These books helped me understand the sins of our American past that set the stage for the inequities many of our citizens continue to experience. I’ll be honest, I didn’t really understand that connection earlier in my life. I didn’t understand what impact centuries of systematic oppression could have on people living today. I didn’t know that poverty is the greatest barrier to student success and that those students in poverty are overwhelmingly of color. I certainly didn’t know about our discriminatory policies such as “redlining” to deny blacks homes in certain neighborhoods (still happening today), that insidiously creates barriers almost impossible to overcome. I’m not trying to equate racial hatred and oppression with political polarization. Isn’t it all though, tied together in some way? Hate crimes in the US are up by 20% since 2016 and in the first three months of 2017 alone, anti-Semitic incidents were up by 86%. We know it has always existed, but a political environment unmoored from norms has unleashed the ugliness. LOVE this! We all are after all, just and equally, human. So, I suspect, my former employee didn’t want to waste energy trying to educate me, when he didn’t believe I would either “get it”, or be part of the solution. 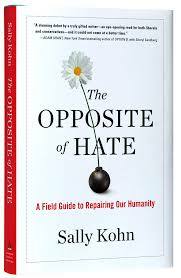 Key to “Repairing Our Humanity” according to Kohn, is understanding our commonality. One great example of this concept is the movie ”Green Book” which I just saw. I won’t go into it here, but trust me, it is a great illustration of the difference connection can make. We ALL, each and EVERY one of us, have a responsibility and role to play, to get us out of the gutter. No one has a free pass that relieves them of that responsibility.